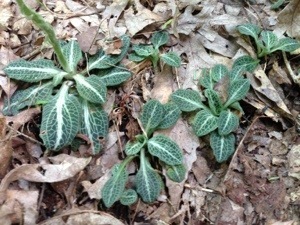 It is commonly called “Rattle snake plantain. The scientific name is Goodyera pubescens. It is actually an orchid. Great find. Come back mid July and I’ll show you the colony. Or next month for the lady slipper orchids. I would enjoy the lady slipper orchids as would my father. We visited to listen to the frogs twice and was amazed at the changes in a weeks time. April 13 we saw Pennsylvania sedge, Carex pennsylvanica and red maple, Acer rubrum in bloom. I think this plant is a Skunk Weed, they Multiply Fast, and they are not safe to Eat .